The global wireless power transmission market was valued at around US$ 4,000 Mn in 2017 and is anticipated to expand at a CAGR of more than 15% from 2018 to 2026, according to a new report published by Transparency Market Research (TMR) titled ‘Wireless Power Transmission Market – Global Industry Analysis, Size, Share, Growth, Trends, and Forecast, 2018–2026.’ Wireless power transmission is transfer of electric energy from one place to another, without the use of conductors such as wires or cables. In wireless power transmission, electric energy is transmitted from a power source to electric loads such as laptops and mobile phones. In wireless power transmission, a wireless transmitter is connected to a power source. The wireless transmitter transmits the field energy generated in the power source to one or more receivers. The field energy in the receivers is again converted into electric current and then used. Use of wireless power transmission has increased. It has opened new avenues for energy management, hassle-free charging, and efficient power transfer. Technological advancements and increase in digitization are expected to drive the global market for wireless power transmission during the forecast period. Advancements in wireless power transmission are rising in terms of resonant inductive coupling and radio frequency technologies. Demand for wireless power transmission is driven by its advantage in terms of elimination of cables, while providing clutter-free charging. This benefit is especially driving the development of consumer electronics devices that can be wirelessly charged. Wireless chargers can sense the amount of power that each electronic device requires so that batteries are not overcharged. Moreover, electricity loss in wireless power transmission is less compared to wired power transmission, as there is no AT&C loss in wireless power transmission. This is anticipated to increase the usage of wireless power transmission further, thereby augmenting the global wireless power transmission market. Other factors driving the market include high operational efficiency, rise in the use of network communications, digitization, and development of infrastructure. Technologies utilized for wireless power transmission is primarily inductive coupling (Qi standard) and magnetic resonance (A4PM standard). Presence of different charging techniques has resulted in confusion for OEMs, component providers, and customers also, in terms of standard adoption. This is likely to restrain the market in the next few years. The impact of this restraint is anticipated to lessen with the establishment of common standards. A key disadvantage of wireless power transmission is its cost. Users need to buy the latest wireless chargers to get higher output from wireless charging devices, as old chargers are slow at charging. Consequently, users need to invest more in the latest chargers. Rising number of applications of the wireless charging technology in health care and industrial sectors is anticipated to help companies expand their product portfolio in the near future. Implementation of the technology in medical scanning devices, implanted medical devices (IMDs), and hearing aids in the health care sector is estimated to provide lucrative growth opportunities to the wireless power transmission market in the near future. Innovations are required to overcome the range barrier in inductive, magnetic resonance, and RF technologies. This is likely to enhance usage of the wireless power transmission technology in the automotive industry in the next few years. This is anticipated to boost the wireless power transmission market during the forecast period, due to high demand for hybrid electric vehicles and eco-friendly electric vehicles. The global wireless power transmission market has been segmented based on technology, range, application, and region. In terms of technology, the market has been segregated into inductive coupling, resonant inductive coupling, capacitive coupling, and others (including microwave, laser beam, radio frequency, etc.). In terms of revenue, the inductive coupling held a leading market share in 2016, owing to high reliability, low cost, and ease in the availability of inductive coupling. Based on range, the wireless power transmission market has been segregated into near field and far field. In terms of revenue, the near field segment held a major market share in 2016. Based on application, the market has been divided into consumer electronics, health care, automotive, industrial, and others (including drones, SPS, etc.). The consumer electronics segment constituted a major market share in 2016, followed by the health care segment. Players operating in the wireless power transmission market are expected to benefit from formation of strategic alliances with global technology providers. Prominent players in the wireless power transmission market are LG Electronics Inc., Samsung Electronics Co., Ltd., Qualcomm Technologies, Inc., Texas Instruments Inc., and Murata Manufacturing Co., Ltd. Several small companies also operate in the market, for example, Energizer Holdings Inc., Powermat Technologies Ltd., PowerbyProxi Limited, WriTricity Corporation, Mojo Mobility Inc., and Viziv Technologies Ltd.
Companies in the market benefit immensely by working along with government agencies such as the National Aeronautics and Space Administration (NASA), SPACE Canada, and Japan Aerospace Exploration Agency (JAXA). A particular area of interest for these agencies is to use the wireless power transmission technology to charge solar power satellites. Essentially, governments are trying to harness the wireless power technology to help overcome global energy crisis. 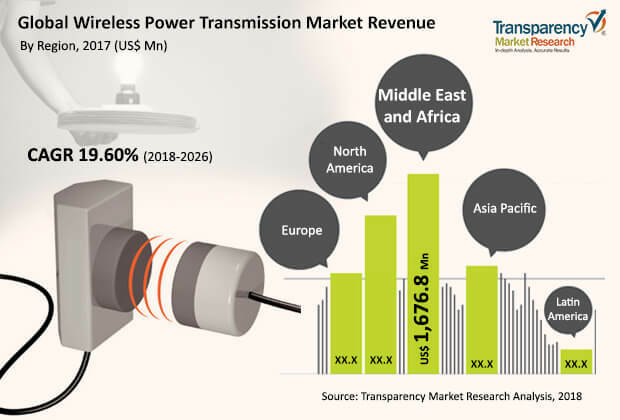 Thus, the rising need for efficient power transfer methods is anticipated to drive the wireless power transmission market in the next few years.